I started easy and thought of physical changes. So first, I had my hair cut. I’d been hemming and hawing for the past few months, and I just decided to do it. After all, the worst thing that could happen was that I didn’t like it, and I could just grow it back out. And even if I hated it, on the plus side, my ends would be trimmed and I would walk around with a lighter (literally) head. I’ve yet to get used to it, but I’m loving not having long locks that tend to tangle, so I’m taking that as a good start. I’ve also re-resolved myself to getting back in the habit of working out. My goal right now is to work out 5 times a week during the work week. I’m trying to take the pressure off myself and just commit to doing anything, even if it’s less than what I have on paper of 30 min. of cardio 5 times a week, plus 20 minutes or so of weight training every other day. Something is better than nothing, or what’s that other saying? “You either ran [worked out] today or you didn’t.” I’m working on checking the former and worrying about details later. Part of the reason why I wanted to start working out again was to get back in shape, but another part (and I think this really should be the bigger motivator) is that I think working out will make me feel better. I’ve been feeling really down the past couple of months, for a variety of reasons. I have a history of depression that I’ve dealt with on and off since my teens, sometimes with medication, sometimes not (always in consultation with my doctor). I’m not on anything now, and I’d like to keep it that way if possible, simply because I’m of the mind that chronic medication is a valid option, but one I’d like to be my last resort. I fully support medication for various issues, and I’ve been grateful for the help they’ve afforded me in the past; I’m simply wanting to try lifestyle and health changes first for myself. I’m hoping getting into a routine that helps me take better care of myself physically will have positive effects on my mood and overall mental state. This wouldn’t be limited to just positive effects on my depression – I’m hoping it helps me be less stressed, more patient, and more positive (which certain studies over the years have attributed positively to exercise). Moving on from the physical, I’m hoping to change my life in general with regards to how I choose to spend my time. Obviously, I work full-time, and those hours are already filled, but I’m aiming to become more discerning with how I spend my after-5 hours. James and I have really tried to reserve some part of our weekend for down time when we can be as productive or as relaxed as we choose. It seems crazy to pencil in a time to relax and do nothing but we find it’s really worked for us. “Blocking out” that time like I would any other time as “unavailable” for any other activity other than doing nothing has made us more resolute about keeping it that way. For us, that down time has coincided with Sunday afternoons, which works for us with our love of football. We’ll have the games on, and he’ll be catching up on email or reading the latest New Yorker and I’ll be doing some light planning for the blog or painting my nails. We’ll lazily make meals and really take the time to eat as opposed to eating while doing something else. It’s been really lovely, and I look forward to sustaining it. And finally, we’ve made some changes to the way we spend our money. This change started awhile back when James was laid off and buckling down was really a necessity. But in the past couple of months, we’ve really started to embrace it as a sound way to be smarter with our money. We found a budget app that worked for us, and we sat down and took a long look at where our paychecks were going (he’s been temping for the past 4 months). It’s been really refreshing and eye opening to see exactly where every dollar is going and what our spending habits are. We have some improvements to make (darn it, Starbucks! ), but we’ve made positive changes already. We keep a much tighter rein on our grocery bills now that we see our impulse buys, I’ve cut my closet in half, and we’re more deliberate about going shopping and just buying the things we need (work pants for him, socks for me). Of course, we keep things realistic and allow for a few cheats (darn it, Starbucks…again! ), but we budget for that, too, so it keeps things honest. We’ve also gone around to paying all of our bills up front (half on the 1st of the month and half on the 15th) to make all of our accounting easier. Whew! I didn’t realize until I finished typing this post how much change we’d tried to make. It’s nice to see the results so far, and we’re looking forward to improving. 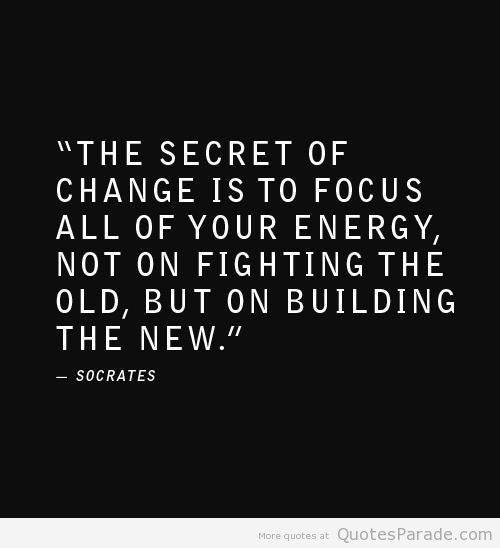 Have you made any changes lately? Thanks, Trish! Have the leaves changed up there?